By now, you know that stocks sold off hard across the globe. Price movements have been big, with intra-day price swings covering months of price movement (and that doesn’t include pre/post market trading). And they’ve been swift, sometimes measured in a matter of minutes. 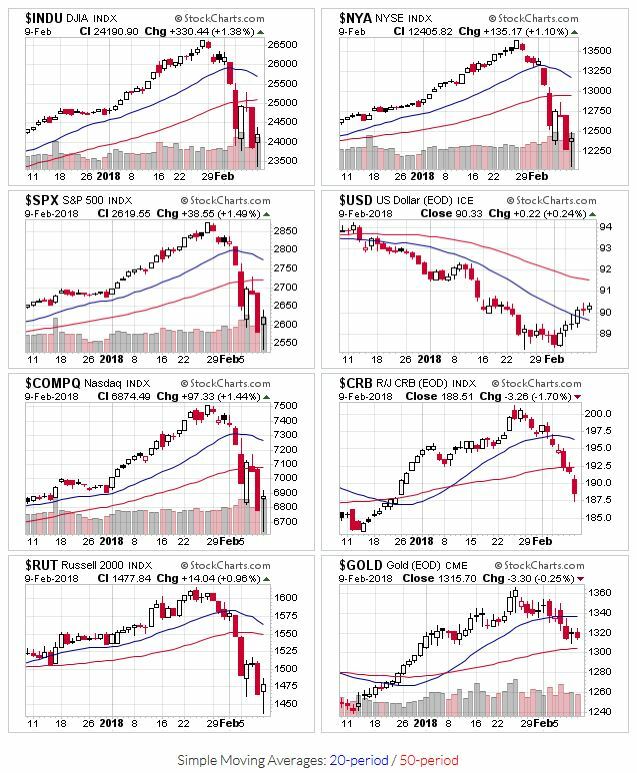 All the market indexes are below their 20-day and 50-day moving averages. Several found support at their 200-day. Given the nature of the sell-off (big and fast), the 50 day won’t be a good indicator to catch the start of the next uptrend. Price and volume action indicates a correction. The growth stocks on my watch list have been weak for weeks, so most of my holdings had already been shown the door ahead of the sell-off. Income stocks got hammered as well, so it may be time to check their valuations and see if you can pick some up on the cheap. OEW switched to a downtrend. They had some good news, with an expectation that we’ll reach new highs again once this downtrend bottoms. So what happened? We had a large, rapid sell off after a long, long period of time without one. The initial cause is thought to be the rise in bond yields. A secondary effect of the price movement was a spike in volatility (rate of change). In the past few years, exchange traded funds and notes (ETFs / ETNs) have been created to calculate price based on volatility; both on the long side and the short side. Those instruments had HUGE price movements in a short amount of time. Those that were betting against rising volatility lost 90-95% of their value. At that level of loss, the fund is usually forced to liquidate. In order to liquidate, the funds managers had to raise capital, which required them to sell other instruments that still had value, namely stocks, sending prices down even more. We didn’t need much downside movement to change the market outlook, so now our attention turns to finding the start of the next uptrend. There are some that think this will be a V-shaped correction, and stock prices will recover as quickly as they’ve sold off. They argue that corporate earnings are still robust, so the underlying fundamentals (revenues, profits, etc.) still justify higher prices. I haven’t seen much commentary on the other side (that this is the start of a new bear market).